Wow, I actually have progress to report this week! This is definitely an encouraging time right now – check out my new stuff! 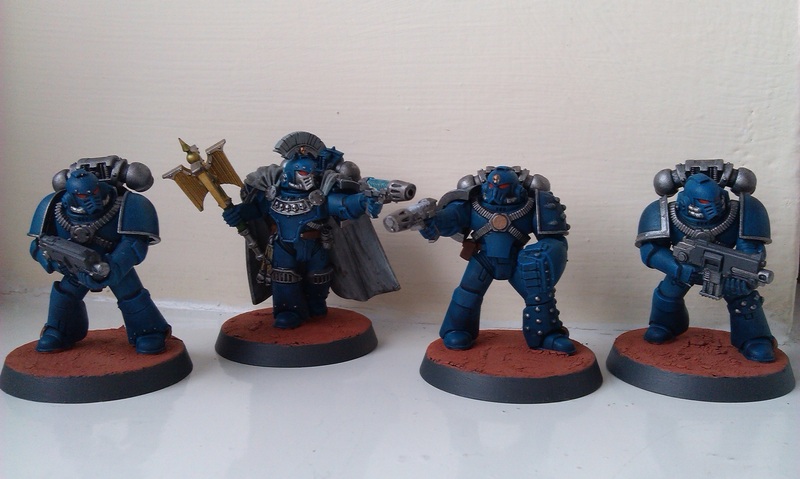 First of all, last week‘s Alpha Legion marines have been finished! And what’s more, I’m calling the Chaplain figure finished, too! These chaps were actually pretty easy to finish, if I’m honest. The Alpha Legion armour is Sotek Green, washed with Drakenhof Nightshade, and lightly drybrushed with Teclis Blue. I probably mentioned this last week. Anyway! From there, I did all the trim bits with Leadbelcher, the most tricky bits being the little studs on the greaves and, particularly, the shoulder pads, but I think I got there. The backpacks were also done in Leadbelcher, even though that of the Chaplain has more of the turquoise colour, though I’m thinking he’s a character, so there we are. I then did the lenses with Wazdakka Red, shaded with Carroburg Crimson to basically try to tidy it all up, then lightly put some Evil Sunz Scarlet in there to brighten it up. The bolter casings were done with Stormvermin Fur, then shaded with Nuln Oil, and the leather belts/pouches/holsters were done with Doombull Brown and shaded with Agrax Earthshade. You can’t really see it in the picture above, but I’ve also done the little tubes near the feet in Balthasar Gold and Agrax Earthshade, because the Alpha Legion Headhunters released earlier this year by Forge World have this, but anyway! That’s right, it’s the Alpha Legion Contemptor Dreadnought! That guy has been built since roughly New Year, and while I had done one coat of Sotek Green on it a long, long time ago, which you can see in this photo from February, but it has never gotten any further. Well, it’s time to change that now! 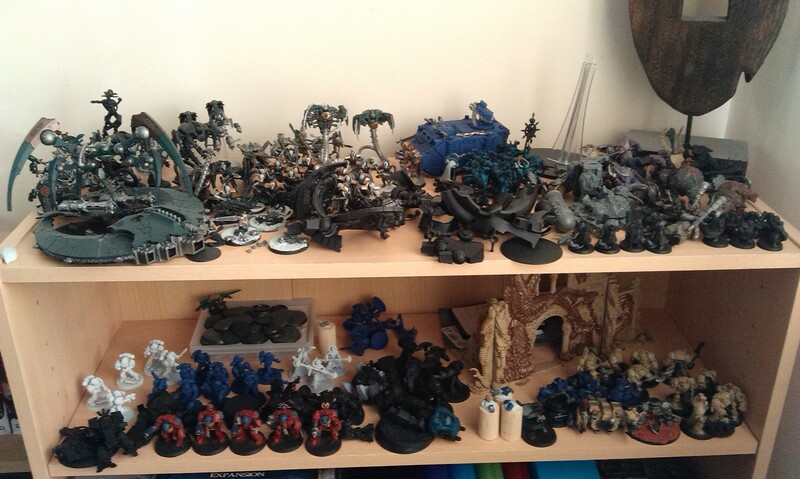 So all of the marines and the dreadnought have had the armour pretty much done, and I had been hoping to get some more work done on them all today, but that didn’t happen! So I’m going to try and get some more work done on these in the coming week, then hopefully there’ll be even more progress next week! But for now, yeah, I finished some models!! Next Next post: Eldritch Moon Prerelease!